but dry times call for drastic measures. We are lucky to have this as an option, albeit a very expensive option this year. This photo is a good demonstration how our flood irrigation works. The paddock is divided into bays. Each bay is level across its width but has a slight fall down the length and has check-banks down each side to contain the flow of water within each bay. We water one bay at a time. The water comes in the top of the bay via an outlet on a channel and runs down the length, spreading across the full width. Before the water reaches the bottom of the bay we close the outlet to stop the flow of water. Ideally the water should just reach the end, but any that goes out the bottom flows into our on-farm drainage recycle system where it is then pumped back into the channel for re-use. I hope the desperate times end soon. For you, and for us all. Very interesting. My step mother's partner near Echuca has irrigation rights and he floods a small paddock for beef from the channel. With excess water going back into the channel your water consumption is very targeted and not wasted, and the water is not lying around to evaporate, and I assume your channels have all been fixed to minimise evaporation and water use is properly metered. But at the end of the day, if there is a lack of water in rivers, then there can't be irrigation. We can move water around, but we can't create new rivers with lots of water. You are right - when there is a lack of water there can't be irrigation and that is how the irrigation allocation system works. We only get irrigation water after there is enough in the system to meet all environmental & human needs (eg town supplies, river flows, high security water holders, environmental watering etc). Only when all those needs are filled do we get an allocation. So some years like in 2016 when the Murray River was in flood we get a full allocation of our water entitlements, but in years like this when it is dry, we get very little. The challenge for us as farmers is to manage that variability. Irrigated farming will always play a role in feeding and clothing Australians, but we have to be very smart how we use that water. Research and modern technologies have improved irrigation efficiencies dramatically over the last 30 years. Farmers grow much more with less water and this trend will continue. Thanks for your detailed reply. It is something I am interested in and care about. Of course those upriver are causing problems with their extraction of water and isn't it always thus. 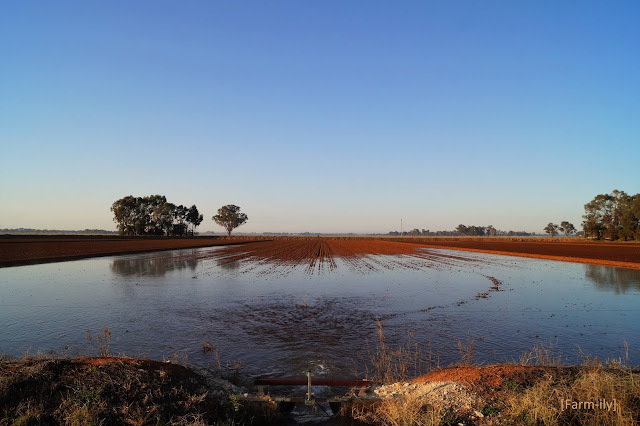 It is absurd for Australia to save water for rice and cotton crops. Other countries produce these crops efficiently. We need to do do what we can do efficiently. I, too, appreciated the more detailed explanation of how irrigation works in Australia. Water rights are always an issue in Kansas as well. Very interesting, now I understand that paddock design I have seen when driving in those parts. And the rain clouds continue to hover and tease. Wow that is quite a system!! I'd love to send you some of our rain!! Now that Spring and Summer are on the way--- well, I hope the best for you.